Massive Price Reduction! Was $145,000 now reduced to a bargain price of $89,000. Interstate owner says sell! What better way to make that happen than a massive genuine price reduction. 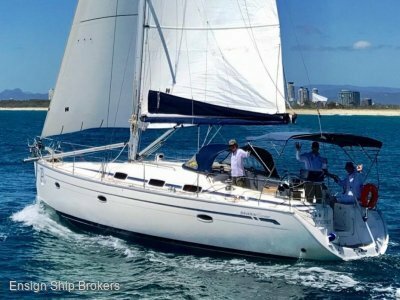 The current proud owner of this fantastic vessel is just not using the boat enough as the distance is just too great along with work commitments he is unable to enjoy it with the family so he says it's time to move it on to someone with the time to enjoy it. 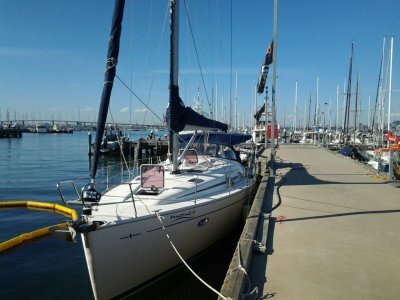 This vessel is now on the market for sale at a bargain basement price of $89,000 As Is Where Is. This is a genuine Renovators Delight! If you are a Handyman or passionate about a bit of work for a great end result then this is the boat for you! The reduced price does reflect the need to tidy up some timber work inside the vessel but I am confident that your inspection will impress despite this if you are after a bargain priced 42 footer. 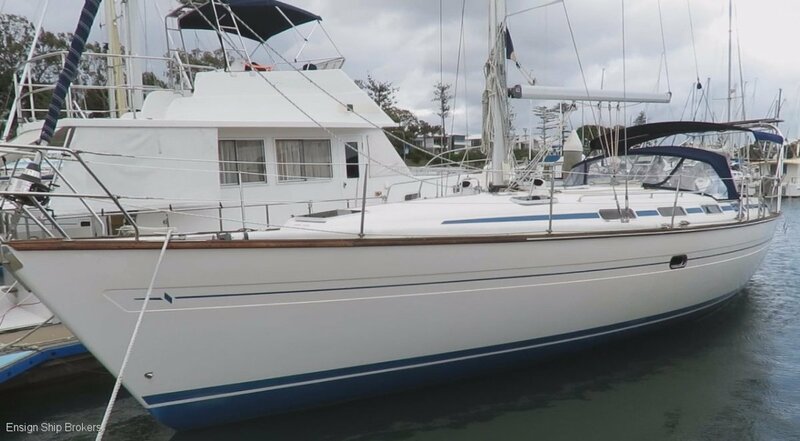 If you are a genuine buyer and ready to act now you will secure this Bavaria 42 for the updated sale price if $89,000 so move quickly as it will not last! Versatility and flexibility of the 4-cabin, 2-head layout combined with the robust Bavaria build quality in that 42 foot "sweet spot" makes this Bavaria Cruiser 42 the perfect family large volume long-term cruising or live-aboard platform. Comfortable, dedicated sleeping accommodations for up to 8, or convert one cabin to a laundry, workshop, walk-in wardrobe or stowage for all the cruising gear, with large volume accommodations comparable to Beneteau and Jeanneau. The lowered cabin sole provides ample headroom and the abundance of hatches lend her large, comfortable saloon a sense of volume and airiness much like Hanse. Luxurious polished timber and sumptuous upholstery throughout contribute to that air of opulence. Her linear galley with 2 burner stove and oven, and generous refrigeration integrates the cook into the social fabric of the boat. The drop-transom converts an exceptionally secure cockpit into a walk-through transom for fantastic access to the water with cockpit shower to rinse the salt off or shower "au naturel". Cruise the bay, coastal or blue water with confidence in the Bavaria build quality and sea-kindly hull form, extra water tank and extra battery. The secure cockpit with central drop-leaf table provides a glorious place to witness those spectacular sunsets at sea or sundowners at anchor with protection from the elements from the dodger, bimini and full deck sun awning, and ample handholds facilitate easy and safe movement on deck and downstairs. 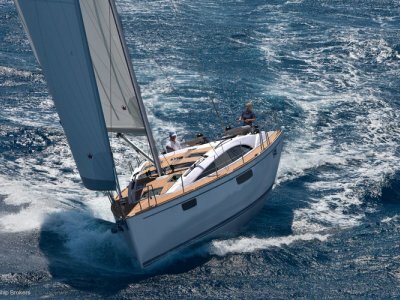 All sail handling controls are led aft for short-handed safety and convenience. Call now, ready for immediate sale. 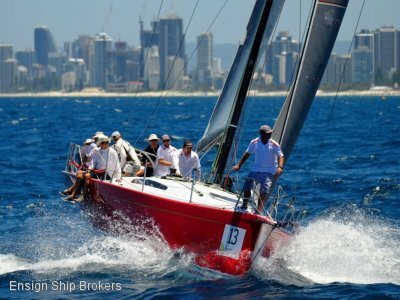 Roller furling mainsail & genoa both new 2008,114 Sqm spinnaker, pole, uphaul & downhaul.